In what angry customers are dubbing “the Fyre Festival of pizza,” a reference to the fraudulent luxury music festival that left people stranded in the Bahamas, the New York City Pizza Festival promised a “day long celebration of the dough, cheese, tasty sauces and delicious toppings.” Instead, people who paid $75 a ticket to get in ended up with teeny, tiny slivers of cold dollar slices on paper plates. The event, which took place in a parking lot in Bushwick, was thrown by Ishmael Osekre, whose African Food Festival was another reportedly disastrous event. “I imagined it would be like, Roberta’s has a brick oven pizza that they tow, there’d be all these different vendors, all this different kind of pizza. And there was none of that,” one attendee told Gothamist. On their Facebook page the organizers blamed late pizza deliveries for why the event wasn’t up to par. “Fresh, diverse, and delicious pizza was supposed to be delivered every 30 minutes,” the post reads. “A make-up tasting will be announced shortly.” But they also appear to have scheduled, at the same time and location, a New York City Burger Festival... sorry my eyes just rolled back so far in my head that I had trouble finishing this sentence... where attendees reported there were no burgers. Some attendees have organized a “victims” Facebook page and wrote that the pizza festival was “a rotten scam,” but I also can’t help question the judgment of people who actually paid $75 to eat pizza in New York City. You can make this same “festival” in your own apartment for far less than that. And if you look at the Eventbrite page for the festival, there were zero actual vendors listed. No Robertas, no Artichoke, no Speedy Romeo, nada. Whether it be pepperoni, mushrooms, onions, sausage, black olives, bacon, green peppers, extra cheese, plain or even experimental combos, there will be pizza for taste buds of all types! I mean... the dude didn’t promise anything except different types of pizza! And he delivered! 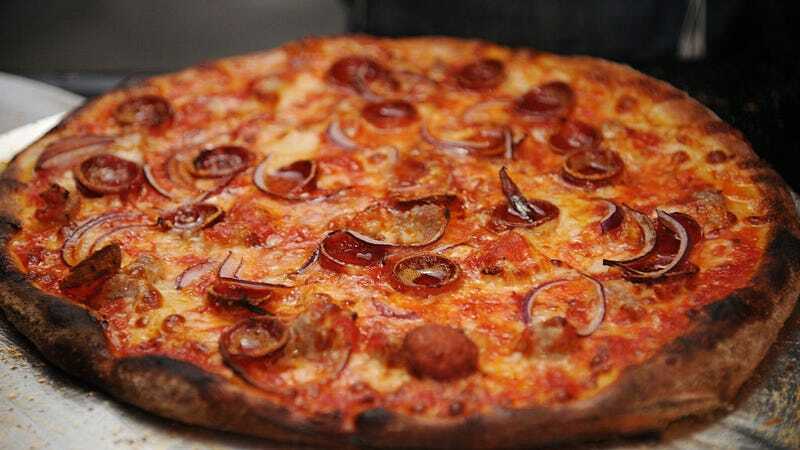 Eater reports that Attorney General Eric Schneiderman’s office has opened an inquiry about the pizza festival and is encouraging attendees to submit formal complaints through their website.